Human deprivation is not confined to consumption shortfalls. 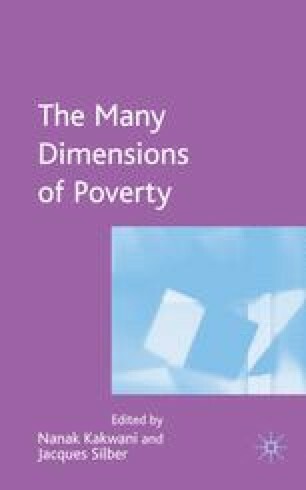 Recent literature is crafting both analytical and empirical frameworks that will reshape our understanding of poverty as a multidimensional condition. Low consumption, below some minimal standard, is but one of the faces of poverty, and indeed the predicaments of the poor may be often due to some other forms of deprivation, such as disease, illiteracy, malnutrition, and also a sense of insecurity and defencelessness as they endeavour to survive in an environment characterized by uncertainty about the future. In this chapter we focus on this last component, and claim that such lack of ‘peace of mind’ is a relevant form of deprivation, as argued for instance by Chambers (1989) and Narayan, Patel et al. (2000). About a quarter of the rural population survive by exchanging labour at market wages and commanding food with what they earn. For them a variation of the exchange relationships can spell ruin. There is, in fact, some evidence that in recent years in Bangladesh the wage system itself has moved more towards money wages, away from payments in kind — chiefly food. More modern, perhaps; more vulnerable, certainly.